Intel's new 8th-gen Core chips now include six cores on the high end, attacking one of AMD's Ryzen advantages. 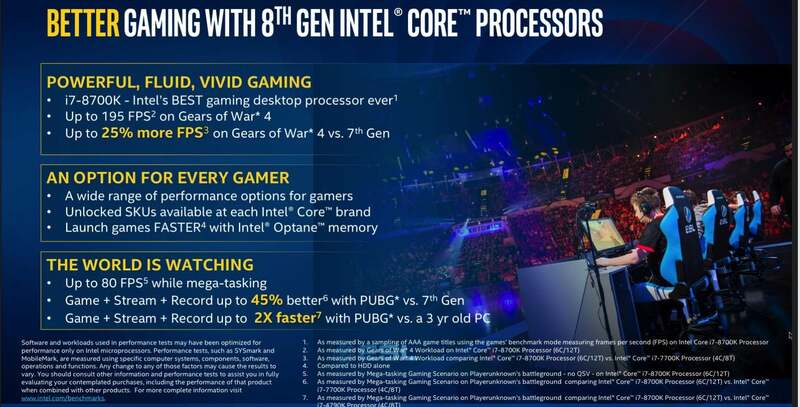 Intel pushed further ahead into its 8th-generation Core series with the launch of its mainstream desktop chips Sunday night, including the 6-core/12-thread Core i7-8700K, which Intel claims is its best gaming chip ever. Intel also beefed up its Core i5 family with 6-core parts, as well as its first quad-core Core i3. Orders for Intel’s new Core desktop chips will begin on October 5, Anand Srivatsa, general manager of the desktop platform group at Intel, said. They will begin shipping later in the fourth quarter. Intel’s new 8th-gen Core desktop parts. Why this matters: Offering additional cores for the same price as an Intel chip has been one of the hallmarks of AMD’s Ryzen offerings. By bumping up its own core count, Intel is not only making itself more competitive, but also trying to cut into one of the selling points of the Ryzen. Of the six new desktop chips announced, the flagship offering is clearly the Core i7-8700K, which Srivatsa touted as Intel's best gaming processor ever. The new Core i7-8700K will offer a 25-percent hike in frames per second running Microsoft’s Gears of War 4, versus the 7th-gen Core i7-7700K—a 4-core, 8-thread part. Multitasking—such as gaming, streaming, and recording using the popular Player Unknown: Battlegrounds—will be a whopping 45 percent faster compared to a 7th-gen part, executives said. In part, that’s because the quad-core mainstream desktop parts of yesteryear are now 6-core, 12-thread parts, as are the Core i5s. Intel’s 8th-gen Core i3 chips, by contrast, are now quad-core parts. Intel’s new processors range from 65 to 95 watts, and from the unlocked “K”-series chips for overclocking and gaming down to more modest entry-level locked Core i5 and Core i3 parts that lack Intel's Turbo Boost capabilities. 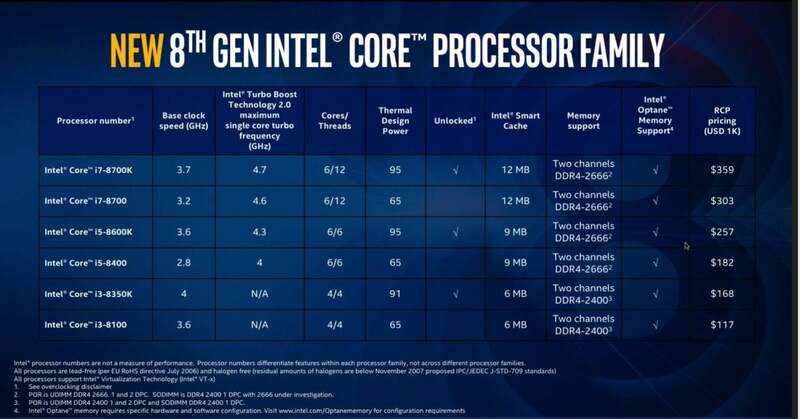 In August, Intel launched the 8th-generation Core family with its U-series family, boosting performance by 40 percent compared with a comparable 7th-generation part. Later this year (and extending into early 2018), Intel will begin to ship even less expensive Celeron and Pentium chips, Srivatsa said. Though they haven’t been verified by testing, Intel provided some gaming benchmarks to compare the new 8th-gen Coffee Lake parts to prior generations. Intel’s new Coffee Lake parts will use the Intel z370 chipset. All of the chips will use the LGA 1151 socket and the new Intel Z370 chipset—unfortunately, not the Z270 chipset used by the Kaby Lake chips. While the Z270 used 2,400MHz DDR4 DRAM, the new Z370 bumps that to DDR4-2666. Intel is touting up to 40 PCI 3.0 lanes for storage, I/O, and graphics, although a system diagram showed a single x16 PCIe 3.0 connection from the processor. Support is built in for 4K HDR, Srivatsa said, with the I/O support necessary for Thunderbolt 3.0. Srivatsa explained that the new capabilities of the 6-core CPUs required new ways of delivering power to the processor on the motherboard. Likewise, alterations to the processor package to enable overclocking, as well as the higher-speed memory support, necessitated a new chipset, he said. For now, the Z370 is the only Intel chipset that's compatible with the new 8th-gen desktop lineup. The "rest of our platform offerings" will be delivered in early 2018, Srivatsa said. The new processors will support Intel Optane, the memory acceleration technology that Intel began rolling out slowly in 2016 and 2017. For now, Optane serves as a system acceleration technology, offering the performance of an SSD on data it can cache, even from a hard drive. 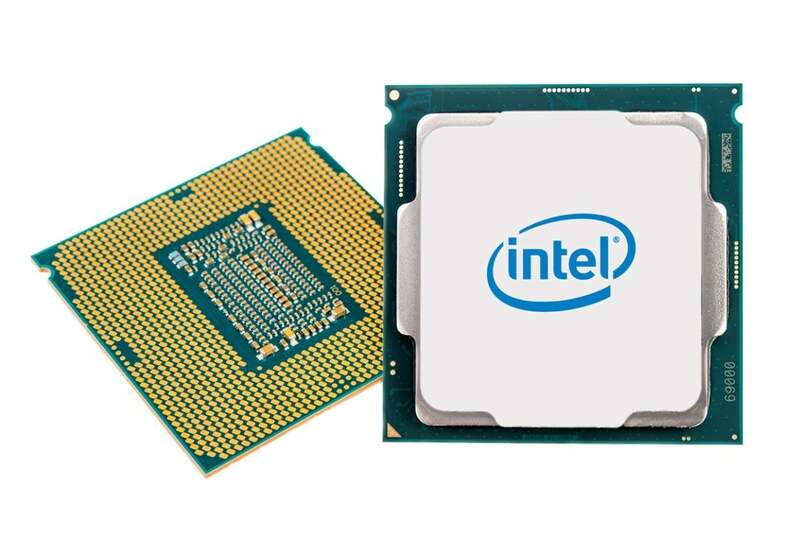 Interestingly, Srivatsa touted the advantages of the new Core i7-8700K even over the recently-introduced Core i9-7800X, a seemingly comparable 6-core, 12-thread part. The reasons to buy the $389 Core i9-7800X include more PCIe lanes and faster memory. Gamers looking for more optimized single-threaded performance, though, should choose the Core i7-8700K, Srivatsa said. The Core i7-8700K chip will ship on the Alienware Aurora, available on October 5 and shipping on October 20, he added. This story was updated at 8:48 PM with additional details.